"That Ogre is... well that's disgusting! 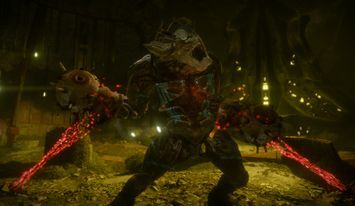 Makes you wonder what they're willing to do to us..."
Kovik's Monster is a Hive Ogre infused with SIVA by Kovik, Splicer Priest, who has had its eye torn out of its socket and attached to Kovik's weapon. It has since become Kovik's bodyguard and pet project as shown in the Wretched Eye Strike. Kovik's Monster is fully immune to all damage for the duration of the fight. It will slowly creep up on Guardians and pound them to death with its ground slam. If Kovik's health reaches a certain damage threshold, then the Monster will go into a rage and begin to charge down on the player's position; additionally, it is faster than other Ogres. The key to staying alive and not getting in the ogre's way is constant mobility, as the Monster will only die if Kovik dies. Kovik's Monster is the only enemy with no way to damage it throughout the encounter with it and Kovik, Splicer Priest. In addition to this, the Ogre is the only modified non-Fallen in Destiny. Kovik's Monster is the only Ogre to not be able to fire Eye blasts as its eye was taken by Kovik.